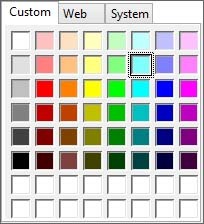 The first step in developing a Visual Basic 2015 application is to build a graphical user interface. When you lauch VB2015, you will be presented with a simple interface, a plain form. 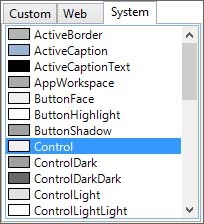 In order to develop a usable program, you need to add some objects to the form from the toolbox, these objects are called controls. After adding controls to the form, you can then write code for all the controls. The purpose of the code is for the controls to respond to events triggered by the user and from a sub procedure. For example, some of the user's actions are clicking the mouse and pressing a key. Therefore, Visual Basic 2015 is also an event-driven programming language. 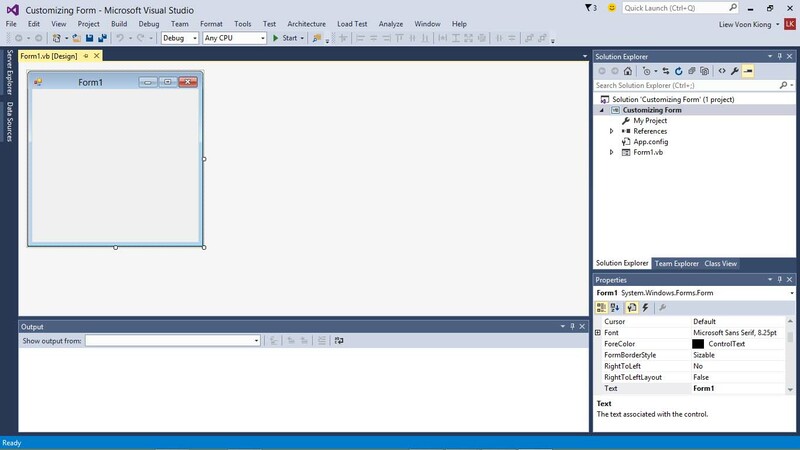 When you start a new Visual Basic 2015 project, the IDE will display the default form along with the Solution Explorer window and the Properties window on the far right, as shown in Figure 2.1. 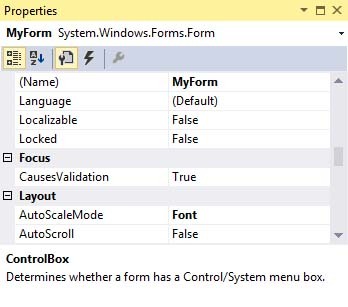 The properties window comprises an object drop-down list and a list of properties. In addition, its bottom section shows a description of the selected property. 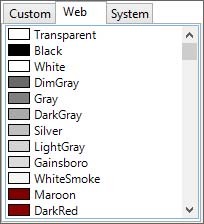 The properties window displays all properties related to an object on the VB2015 IDE, in this case, it is Form1. Besides that, it also displays the properties corresponding attributes or values, as shown in Figure 2.2. The runtime interface is shown in Figure 2.6. 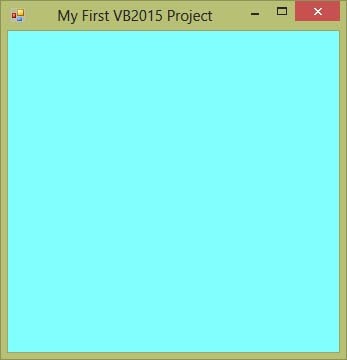 Notice that the title of the form has been changed from Form1 to My First VB2015 Project, the background changed to cyan color and the window cannot be maximized.